Rarely available Garden Villa in highly sought after 55+ resort community of Cypress Falls at the Woodlands in North Port, Fl. Home Warranty incl. w/ this 2 bedroom, Den, 2 bath, 2 car garage home with 1457 sq. ft. of living space. Welcoming lead glass front door with large foyer and coat closet. Open great room floor plan featuring Lg open kitchen with eating space. Master bedroom has oversized walk in closet, ensuite with walk in shower, dual sink vanity, upgraded shower tile, glass shower doors. Guest bedroom has built in murphy bed. Inside laundry closet. Den makes a great office or media room or additional guest space. Upgraded light fixtures throughout including recessed lights in living room. Kitchen features 42 inch upper wood cabinets, solid surface counter tops, breakfast bar & eating space. 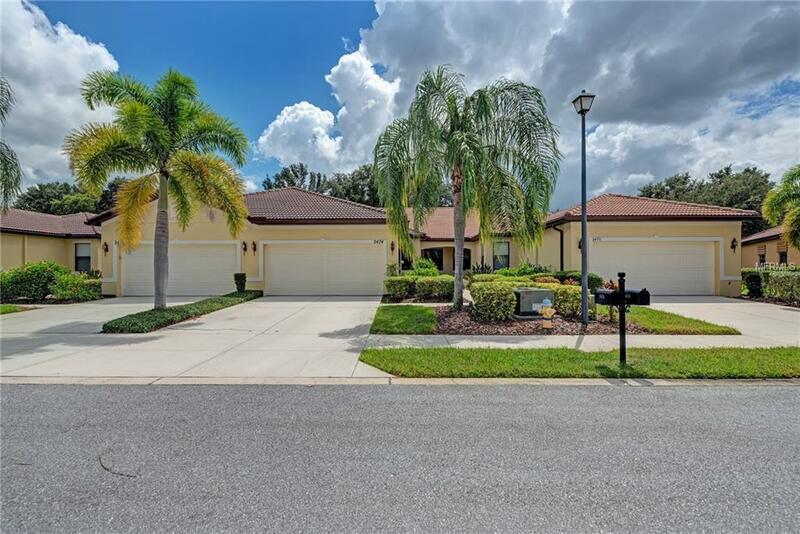 Sit back and enjoy the peaceful setting on the covered screened lanai Enjoy the ease of villa living in resort lifestyle community of Cypress Falls. Cypress Falls is a beautifully manicured 55+ community. Gated entrances. Fantastic clubhouse, athletic center, heated resort style pool & spa w/ additional resistance pool, great for water exercise. Grand Ballroom, covered Verandah, BBQ area with seating, 2 tennis/pickleball courts, 4 bocce ball courts, Horseshoe pits, arts & craft room, catering kitchen with wi-fi cafe and community garden. Coming Soon a Dog Park. Located near 1-75 and US 41. Close to shopping & all SW FL has to offer including the new spring training home of the Atlanta Braves.